So said Albert Einstein, the genius whose imagination gave us the famous theory of relativity. Now, we can't all be Einstein's, but we can all benefit greatly from a well developed ability to imagine. Recent brain research tells us that one of the best ways to stimulate a child's imagination is to provide them with plenty of opportunity, props and the space in which to "pretend play". 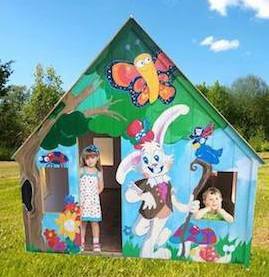 Just as a blank canvas provides the space in which the artist's imagination and creativity can be expressed, a wooden playhouse provides the space in which your children's imagination and creativity can blossom. One day they'll be holding a tea party or fighting space aliens -- the next they'll be planning their imaginary wedding or launching their imaginary candy empire. These seemingly meaningless and silly activities are actually the best possible tools your kids have for learning and growth. 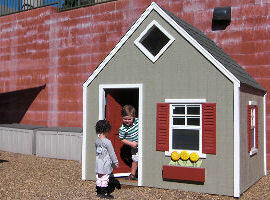 They are exactly the kind of experiences your kids need in order to become fully functioning, happy, successful adults.